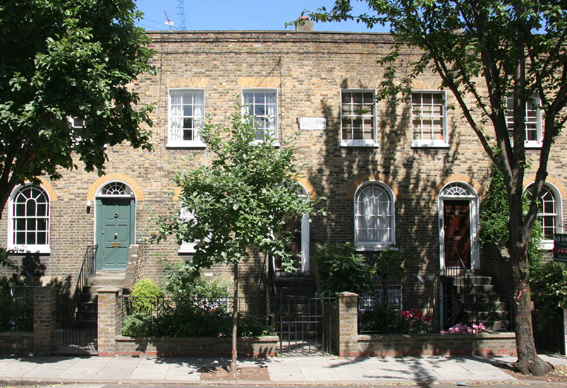 After leaving Benwell Road in Holloway the Harris family moved into number 12 Ellington Street Islington. The Rate Book above shows the Harris family at number 12 in 1890. Unfortunately this house was bombed during World War 2. The photo left is further along a surviving section of this terrace.Below is the 1891 census taken in April. This shows Lambert W. Harris, a Wood Polisher with his wife Alice, and their children Lambert Thomas aged 10, Alfred aged 9, and Walter aged 3. Also living in the family home was Alice's mother Mary Ann Bristow shown as a book folder in the book binding industry. In 1893 the family moved to 4 Half Moon Crescent until 1894.